Cabin fever, seasonal affective disorder, mild depression, whatever you call it, it is a malady that affects rural people and northerners in the middle of the winter, in the dreariness of winter weather. But once you understand what it is you will have in your hands the way to overcome cabin fever. It’s February. Have you caught it yet? The dull, cold that creeps into your bones. The listless routine of every day, that allows your mind to wander, so that you forget what you were doing. You can’t remember where you put your coffee cup, so you pour another one. You stand in front of the open refrigerator with no idea what to cook for dinner, your creativity gone with the last load of dishes that you washed and pulled the plug on. And if you hear one more complaint from a whiny, high pitched voice, you are going to scream. You notice that you have more bruises than usual and vaguely remember bumping into things and dropping things, as your coordination and balance become impaired. Cabin Fever hits most Northerners in the middle of winter, around mid February. The long nights, short, grey days and lack of sunshine, cold, closed spaces, and lack of mental stimulation trigger a shutting down of cognitive abilities, and mild to moderate depression can set in. In more severe cases, paronoia, an urge to run away, and fatigue accompany the symptoms. While it seems to be a disease of rural areas, even those in the city can suffer from its debilitating grasp. Cabin Fever can be exacerbated by isolation, poor nutrition, lack of fresh vegetables and fruit, poor indoor air quality, vitamin D deficiency, and routine. Watching TV reruns and playing computer games can increase the mental dullness and contribute to lack of concentration and forgetfulness. Often colds or flu symptoms further increase the fatigue, loneliness, and depression. People isolated in rural areas, by severe weather, and close spaces seem more at risk. More women are affected than men, possibly because women spend much of their lives indoors, while men tend to travel to work. With the increase in people unemployed or working from home, cabin fever may be on the increase. Cabin fever is an idiomatic term for a claustrophobic reaction that takes place when a person or group is isolated and/or shut in a small space, with nothing to do, for an extended period (as in a simple country vacation cottage during a long rain or snow). Symptoms include restlessness, irritability, paranoia, irrational frustration with everyday objects, forgetfulness, laughter, excessive sleeping, distrust of anyone they are with, and an urge to go outside even in the rain, snow, dark or hail. The phrase is also used humorously to indicate simple boredom from being home alone. The term was first recorded in 1918.Other references have the term in use at least to 1906. Cabin fever is a malady of winter. It can affect those living rurally, as well as those living in the city. Isolation seems to be the biggest contributor to the problem. 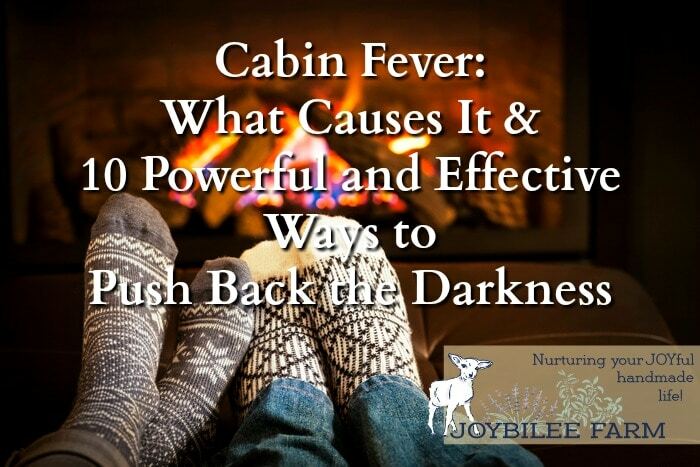 When you find yourself with irrational thoughts, frustration with every day objects, forgetfulness and restlessness, there are steps you can take immediately to relieve your symptoms of Cabin Fever and get back your Joy — and Joy is what Joybilee Farm is here to help you with. Lots of retired folk in Canada go south to warmer climates where the sun shine is more intense in winter, and they can bask in the vitamin D making rays. But if a trip to Mexico or Arizona isn’t in your budget this year, there are several things you can do to overcome the winter blues right where you live. 1. Take a good quality vitamin D3 supplement. The government recommended dose is not enough to help you overcome vitamin D deficiency and a greater part of the symptoms of Cabin Fever are related to lack of vitamin D. The Canadian government recommends that all citizens take vitamin D beginning at the end of September to prevent depression, colds, flu, and bone density problems. But if you didn’t, you need to build up your reserves again. Make sure your supplement is D3 and not D2 which is not usable by the human body. This is the supplement I use. 2. Stimulate your brain cells by learning something new. Watching sitcom reruns, and reading the news headlines, or romance novels, won’t help your mind, as the winter blues set in. You need to stimulate your brain cells and excite the neuropathways to grow fresh connections. Routine stimulation like playing solitaire or doing crossword puzzles, while good exercise in normal circumstances, becomes routine during the Winter Blues. You already have those neuropathways well developed and you can play solitaire with your brain engaged on something else. To overcome Cabin Fever you need to up your game, and learn something new. Bonus points if the new learning engages your body and your mind and helps you develop new body memory. This is a good time to learn to knit, crochet, spin, play a musical instrument, type, learn about herbal remedies, or write a book. The action of learning something new and then following through with thinking and a body action will increase the development of fresh neuropathways and lift your mood. 3. Decrease your consumption of grains and sugar, and increase the protein and saturated fat in your diet. Blood sugar imbalance can increase your irritability and forgetfulness. Although winter seems the time most of us turn to “comfort food” that is high in carbohydrates and sugars, that may be a contributing factor in mood irritability and depression. It also increases weight gain, a symptom of winter blues, that most of us would rather not have. By decreasing carbs and increasing good quality protein — organic eggs, grass fed raw milk cheese, butter, grass fed raw milk, grass fed meat, and wild caught fish — our mood can be stabilized and our bodies have the energy and building blocks to repair the breaches. 4. Add Extra Virgin Coconut Oil to your diet. Extra Virgin Coconut Oil has been shown to increase cognitive function. The brain is able to use the medium chain fatty acids in coconut oil as a fuel, instead of glucose. Coconut oil has been shown to improve thyroid function, and increase weight loss. When taken as a dietary supplement it has a detox effect, flushing the system and improving glandular function, as well. Human connections through friendships increase our sense of well being. More than just a superficial “hello, how are you?”, deep conversations where we can test our thinking against the foil of our friends help to anchor us in our place in the world and remove the feelings of hopelessness and isolation that Cabin Fever can bring. Ideally meeting with a friend face to face, exchanging hugs as well as conversation, will bring the most benefits. But if you are unable connect because of foul weather, a phone call or internet chat is also beneficial. Totally isolated in a new environment, online classes can sometimes help you establish connections, but are not a long term substitute for face to face interaction. Humans need interaction with fellow humans to remain sane. Solitary confinement is a mode of torture. Inside air quality can suffer in winter, when the windows remain closed or are covered to prevent air exchange with the outdoors. Space heaters, central heating, and wood stoves can increase indoor air pollution. Humidity and molds further decrease air quality. Getting outside when its snowing or raining increases the negative ions that you absorb which elevate mood. Further, the increase in light just from walking outside helps, as well. If you can get away to the mountains or the park and interact with nature, you get bonus points for your mood. 7. Exercise at least 30 minutes 5 days out of 7. A brisk walk, a heavy routine of house cleaning, dancing, walking on a treadmill or riding an exercise bike will increase your heart rate, help remove toxins from your body and increase endorphins in your brain,which elevate mood. There are many health benefits to daily moderate exercise, including the prevention of heart disease, cancer, and obesity. I’m not talking about fitness training here, but simply doing something that causes you to sweat for at least 30 minutes every day. If its been a while since you exercised consistently start slowly — heavy training that tests your endurance shouldn’t be undertaken haphazardly. The old school of military aerobics training has been shown to cause heart damage, so I’m not talking about heavy workouts, here. The goal is consistency, rather than intensity. Men and women of faith have an anchor to hold them in the storm. 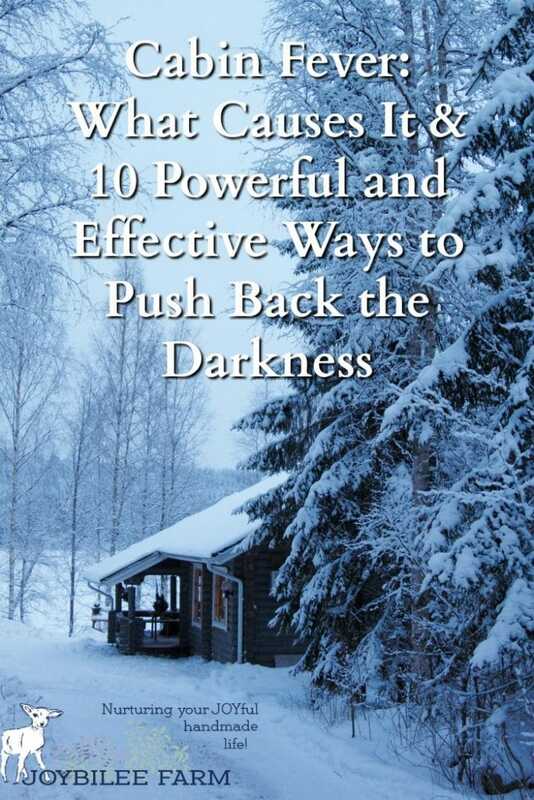 Look to your own faith traditions for light in the darkness of winter. If you find yourself with serious mental instability, depression and lethargy that you can’t overcome with simple remedies; or if you have suicidal thoughts, or irrational anger and thoughts of harming others — the most severest forms of cabin fever — seek out a trusted mentor that can pray with you, counsel you, and help you in your troubles. The internet is not a substitute for real life, human contact. Talk to your rabbi, your pastor or your priest. Don’t be afraid of appearing needy or of being judged. God is not too small to help you in your time of need. The men and women of faith from centuries ago referred to a “dark night of the soul” as a time testing, and a time of increasing their faith. If this sounds like what you are facing — find a trusted mentor that can help you navigate in the storm that you are facing. If its been a while since you made contact with your faith tradition, do it any way. Love yourself enough to ask for help. If the first contact you make is unsatisfactory, try another rabbi or pastor. Learn to pray and ask God to help you. Prayer is an amazing conversation, where we tell God where we are at, how we feel, what we think we need and then we listen. He talks back to us, throughout the day, in our thoughts, in our circumstances, in what we read on a page, or things that people tell us, or even what we see in nature. God helps us make the connections that we otherwise would not make. And God helps us in our problems. Even if you don’t believe in God, you can still pray to Him. And even if you do not believe in God, He will still talk to you. Planning a spring garden is a therapeutic and hopeful action. Looking through seed catalogues, placing orders for seeds and starting seedlings indoors for Spring planting can increase your hope and mitigate some of the dull, dreariness of the winter blues. Many gardeners spend their winter days drawing out garden plans and flipping through seed catalogues over and over again for the hope and euphoria that planning the spring gardens bring. If you haven’t tried this cure for Cabin Fever, this might be the year to plant a garden — even if you live in an urban environment. Growing vegetables can be done on a balcony or on a roof, as well as a back yard or a farm field. Consider signing up for an allotment garden in your city or partner with a CSA, and sign up to help in the Spring gardens. Just the hope of Spring gardening can stimulate your imagination and ease the pain of Cabin Fever. Since mindless routine can increase the malady of Cabin Fever, expressing your creativity can help you overcome it. Your creativity is the unique expression of your own passion, motivation, and ideals. When you exercise it through artisan craft, art, writing, music, or dance, you integrate the different aspects of you and through the act of creativity, you bring wholeness to yourself as well as others. Don’t over look creative actions as a way to rise above irritability, depression, and to push back the darkness. Cabin Fever is a temporary malady brought on by low light levels, lack of vitamin D, and decrease in mental stimulation. While it can cause mild disability or major catastrophic debility, there are a few things that you can do to overcome its discomfort and maintain your mental and physical well being. Let me know how these suggestions work for you in the comments. It’s actually a great and helpful piece of info. I’m satisfied that you simply shared this helpful info with us. Please stay us informed like this. Thanks for sharing. Besides feeling everything you described, I find myself attracted to bright, beautifully colourful pictures to cheer me up. They provide incentive and inspiration to create – much like your amazing handdyed rovings! Visual aids to cheeriness like bright pictures are a great therapy for Spring Fever, Fran. I wonder if that’s what makes seed catalogues so inviting.